Ernie Ball Cobalt bass strings are made of a new alloy formulation that gives you higher output, better sound, and longer life. Cobalt strings' special iron/cobalt blend attracts the magnets in your pickups better than any other alloy. When you string up with Ernie Ball Cobalts, you'll immediately notice the incredible comfort these strings offer - silky and pliable under your fretting fingers; your fingers will seem to glide over the strings, letting you execute fast passages effortlessly. And when you plug in, you'll get increased power, beefy yet defined lows, improved midrange focus, harmonics, and sustain, and crisp highs. 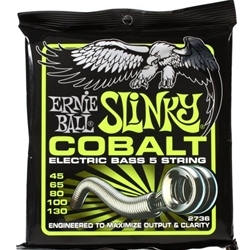 Try a set of Ernie Ball Cobalt strings - you're gonna love 'em!